The last few years must have been cathartic for Mike Doughty. Despite the fact that this is now his 9th solo album (depending on what you count), Doughty is mainly known as the frontman of the 90's alt-everything phenomenon Soul Coughing, an experience that was so painful that he's always preferred not to talk it, to the point where it became a major elephant in the room every time he'd play live. He recently wrote a book about his Soul Coughing years that details exactly why he split up the band and why it's such a sore spot for him (Cliffs: lots of drugs and a growing suspicion that the other band members didn't exactly have his best interests at heart) as a way to get this all out, but his bitterness remained. During the last two years, in a move that ought to be surprising to anyone who's ever heard an interview with the guy (or read his book), he recorded an album's worth of re-imagined Soul Coughing songs, a longer album of solo acoustic versions of those songs (Water and Washington), and to finance this album, an all-Soul Coughing live set. There's an urge to be cynical here and say, "hopefully, if you look hard enough, you can find the Soul Coughing versions of Soul Coughing songs", but that resulting live album, Live At Ken's House (apparently, Ken was not home), alleviated a lot of the issues I had with the whole thing; the songs are freakier and more energetic than on the studio album, and he (thankfully) gives the bassist and drummer enough space to give the tunes the groove they deserve. Granted, they're still not up to snuff with the originals; it's tough to replace that much instrumental talent - but they're a lot closer. It's a neat development, as the musicianship on Doughty's albums is rarely worth talking about. For the most part, less is more and more is less for him; his best albums tend to be those that are the barest, while his worst ones often suffer from the guy simply trying to do too much. It seems as though the ghost of Soul Coughing created a dichotomy in his work; on one hand he's tried hard to distance himself from that band's shtick and create his own thing, but on the other he's endlessly spinning his wheels to try and recapture the flippant spark of his old group. As a songwriter, Doughty never changed that much; a lot of his songs use the same chord progressions and structures as the ones he did with Soul Coughing. A lot of his work is marked with an attitude of "I was actually the weird guy in Soul Coughing, and look at all these weird things I have done on this album", but almost nothing he does would sound out of place on rock radio. Somehow, you have to imagine Mike Doughty was aware of all this. 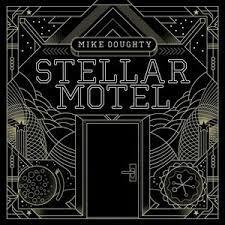 Stellar Motel is very much a different kind of Mike Doughty album; you keep waiting for that 'St. Louise Is Listening' chord progression to show up, and it never does ('Change' comes oh-so close, but juuust pulls back). Rather, this is Doughty's hip-hop album, something that stands apart from anything else in his discography. And I don't mean "hip-hop influenced", like what a lot of Soul Coughing was, or say his excellent John Denver-sampling "Sunshine" from two years ago, but like, actual hip-hop. DJ Good Goose handles a lot of the beats and production, and 7 of the 16 tracks have features on them. The entire process was documented on Pledgemusic; not just the recording, but the writing of the songs themselves, which seems to have been rather off-the-cuff, based on a lot of improvised bits and experimenting around. This gives everything a loose atmosphere - they don't really overthink anything, letting the music get driven more by excitement than craftsmanship. Granted, I think of Doughty as the kind of guy who wants to surprise his listeners every time out, but outside of his recent covers album he hasn't really been able to do that very often. Stellar Motel is full of surprises - there's a song with a sax-and-drums trio called 'Moon Hooch', one with a verse in Japanese from a member of the Uhnellys, a lead single based off mangled banjo strumming ('Light Will Keep Your Heart Beating In The Future'), acoustic pop songs that interject 8-bit electronic noises ('When You Come Home', 'Better Days'), two songs with F-bombs in the title, and one that I am pretty sure uses the word "Trotskyite", and that's vintage Doughty all the way. It's kind of a mess, and I assure you it doesn't all work ('Pretty Wild' is this album's requisite "wish I didn't have this stuck in my head" tune, closer to 'Hollaback Girl' than 'Na Na Nothing'), but the songs are brisk, as nothing even hits the four minute mark, and there's no feeling of "didn't I just hear this?" on this one. Even if the songs don't work for you (fans who only liked the more sparse, downcast music on Skittish or Sad Man, Happy Man may not find much on here), you have to admit it's entertaining. This is all welcome, considering the team of Doughty and Good Goose were responsible for last year's Soul Coughing Re-imagined album, which was pleasant enough but largely predictable and punchless. Here, it feels like Good Goose grabs the reins a little harder; Doughty's ear for dynamics and a clean mix is still present, but there's so much more sound here; the beats are thick, the acoustic guitar rings off the wall, and Doughty's voice is just where it needs to be. But what really makes Stellar Motel tick is that it grabs that trademark Doughty left-of-center essence that often marked his best work, and his freewheeling, stream-of-consciousness lyrical sense is as good as ever. It doesn't try hard to be weird, but it very much is. I mean, I can count on one finger the number of songs featuring a guest rapper and a guest cellist. And yet, a lot of these songs will slot in fine with his acoustic set, and there's no denying Doughty's pop sense - 'Light Will Keep Your Heart Beating in the Future', 'The Champion', and 'The Brightness' all sound like hits to me; these are easily some of his best, with the added bonus of not really sounding like anything else in his catalogue. Ironically, it captures the atmosphere of "songs first, but anything goes" that was so prevalent in Soul Coughing much better than his disc of actual Soul Coughing songs. I guess that's one way to slay an elephant.